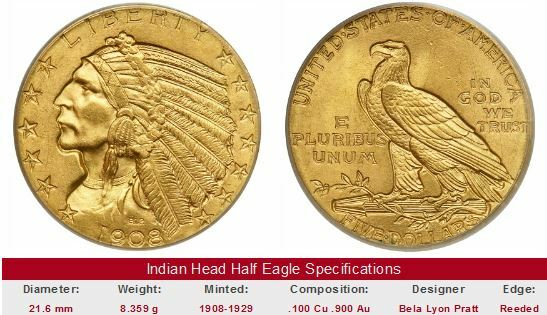 Indian Head Half Eagles: The $5 Indian Gold Coin was Minted 1908-1929. In 1908, the Indian Head design of Bela Lyon Pratt was placed on the nation’s $2.50 quarter eagles and $5 half eagles. Pratt’s design was unlike any other seen in American coinage, in that the features of the coin were incused (meaning indented or recessed), as opposed to raised above the surface. The foremost agent of change during the early years of the 20th century was President Theodore Roosevelt. One of his goals was to upgrade the artistic qualities of U.S. coinage, to the level of becoming a source of national pride on the world stage. One of the president’s closest friends was a Boston doctor named William Sturgis Bigelow. A connoisseur of history and the arts, Bigelow had studied the incuse nature of wall designs from ancient Egypt, and suggested a similar approach to U.S. coinage. Never afraid to try something new, Roosevelt agreed, and Bigelow procured the noted sculptor Pratt to prepare the models. The obverse depicts a Native American wearing a war bonnet. The reverse is dominated by a vigilant eagle resting watchfully upon a fasces bundle tipped by an arrowhead, held together by an olive branch, symbolizing both military strength and peace. Dear Sir, I am sending to the mint at Philadelphia, the model of the coin which I have prepared and I hope same will prove satisfactory. I wish that those in charge of making the die would follow the models absolutely or at least would make no changes without consulting me. I shall be exceedingly interested in seeing the finished coin. Will you kindly let me know when we may hope to see the coins? Yours etc. Dear Sturgis: I enclose you the visible proof of a great service you have rendered the country -- and I am speaking with scientific accuracy. Here you will see the five dollar gold piece, the copy of the models you have prepared, and a month hence our five dollar gold pieces that are issued from the mint will all be of this type. This one I send you as the first one struck. It therefore has a peculiar interest and I feel you are peculiarly entitled to have it; so please accept it with the compliments of Director Leach and myself. Ever yours, etc. The half eagle referred to by Roosevelt in his letter above never reached Bigelow; apparently it was stolen after the letter was sent. Dear Mr. President: I have...an interesting letter from Mr. Samuel Hudson Chapman concerning the new gold coins... He says the head of the Indian is "without artistic merit and portrays an Indian who is emaciated"... The answer to this is that the head was taken from a recent photograph of an Indian whose health was excellent. Perhaps Mr. Chapman has in mind the fatter but less characteristic type of Indian sometimes seen on the reservations... "The sunken design will be a great receptacle for dirt and conveyor of disease, and the coin will be the most unhygienic ever issued. "...The question of hygiene has more relation to silver coins than gold, as they find their way into dirtier pockets. A dirty gold coin would be an anomaly. I have never happened to see one. 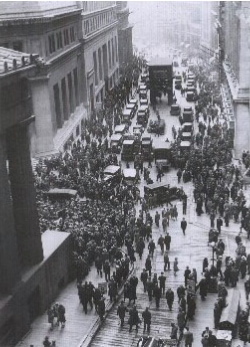 A large crowd gathers in front of the Wall Street stock exchange in New York on "Black Tuesday," October 29, 1929. Panic began settling in on the trading floor on October 24, but it was on Black Tuesday the stock market utterly collapsed. The Wall Street Crash had a major impact on the U.S. and world economy. The decline in stock prices caused bankruptcies and severe difficulties, including business closures and millions of lost jobs. The resultant rise of mass unemployment and the financial turbulence came about as a direct result of the crash, but the crash itself was not the single event that triggered the widespread downturn. Because Black Tuesday is so readily associated with the crises that followed immediately, it is generally regarded as beginning of the Great Depression. Other complaints abounded: concern over counterfeiting, stacking capability, coin thickness, and more. Unshaken by the naysayer corps, Roosevelt allowed the Bigelow-Pratt gold coinage to continue, with no alterations to the design. The Indian Head Half Eagle was minted from 1908 through 1916. Production was then suspended until 1929, when 662,000 pieces were struck, most of which were destroyed before ever leaving the Mint. As the Great Depression took hold, economic conditions precluded additional production of the $5 Indian gold coin. The demise of the Indian Head five dollar gold was the last the nation would see of the half eagle in circulation. Since United States gold coins were first minted in 1795, by far the most successful face value denomination in American life was the half eagle. From 1795 to 1916, half eagle production was skipped in only three years: 1801, 1816 and 1817. Through political uncertainty, financial catastrophes and war, the half eagle was indeed a fellow traveler in America's journey. It is a wise move to buy only key date Indian Head Half Eagles that have been certified by one of the four leading grading service companies: PCGS, NGC, ICG, or ANACS. If you're dealing with a seller of unchallenged reputation, then perhaps certification by one of the Big Four is not as critical. Grading is so important that it cannot be overstated. Prices for key date Indian Head Half Eagles double or triple when comparing MS-60 to MS-62. Some of the less exacting dealers utilize lesser known grading services and have been known to offer a "bargain" price for a coin they claim is MS-62. Inexperienced buyers quickly latch onto their lucky find, only to discover that the coin is regarded as an MS-60 by widely accepted numismatic standards. Don't get caught in this unfortunate trap. The "Sales Boxes" below initiate a search of eBay coin auctions to find the key date Indian Head Half Eagles indicated on the left side of the box that are currently for sale. The left hand side also lists value trends over a very long period of time for the key date in XF-40 condition. The percent annual increase since 1950 is computed to facilitate comparisons. You may have luck finding several examples of the 1909-O and 1911-D to choose from, but the 1929 is a different story. As you sort out your choices, be certain to heed the grading advice above. The coin pictured for sale in the right hand side, if any, is not necessarily the same condition coin as that represented in the value trend analysis on left hand side.